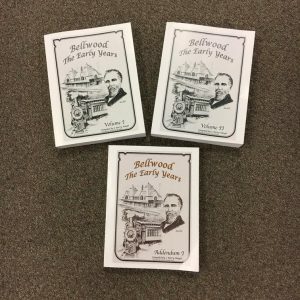 Local historian J. Perry Haupt has compiled a collection of archival materials from the library’s history room in a series of books titled Bellwood: the Early Years. Volumes One and Two can be purchased in a set for $75 and an Addendum volume is available for $35. There are also DVD-Rs edition of the first two volumes and the addendum available for $25 each. These DVD-Rs can only be viewed on a computer with a disc drive. Proceeds from the sale of these books and DVD-Rs benefit the library. 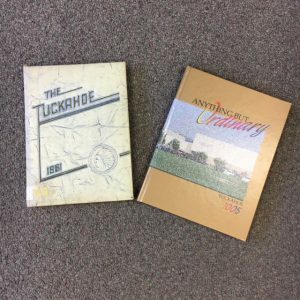 The library has a wide variety of Bellwood-Antis High School yearbooks available for sale. To see if your graduating year is available, e-mail jfcameron@blwd.k12.pa.us. Yearbooks are $35 each. The Bellwood Quilting Bees sell a variety of beautiful handmade items to support the library, including mug rugs, decorative wall hangings, scarves, pouches, pins, gloves, and key chains. See what they have for sale on the display tables located near the checkout desk. The library also has handmade afghans and baby hats for sale. Afghans are $25 and hats are $5. Proudly made in the USA, Rada Cutlery is a great gift for the chef in your life, or treat yourself! The library has a variety of knives available. Ask at the checkout desk for a list with prices and sizes. Everyone loves Gardner’s Candies famous peanut butter pretzels! Treat yourself or someone you love with a package, and support the library at the same time. We always have a jar of pretzels at the checkout desk. They’re just $3.00 a package. Not local? We’re happy to mail any fundraising items directly to your door. To arrange a mail order purchase, e-mail jfcameron@blwd.k12.pa.us or call us at 814-742-8234.